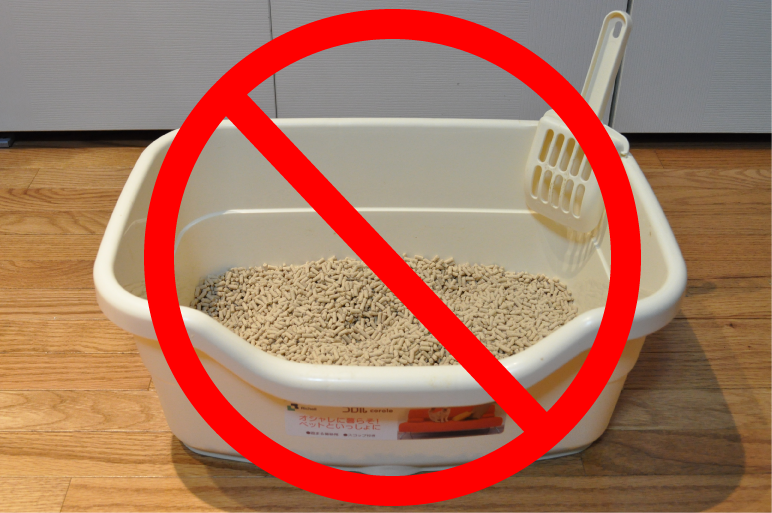 The first reason we don’t recommend the kitty litter method is that the urine/feces scent could attract aggressive cats into the yard where a missing cat could be hiding. Cats are territorial and when an indoor-only cat escapes outdoors, that cat is often hiding within the territory of another (outside) neighborhood cat. Dirty cat litter can attract community “tom” cats (intact male cats) or other territorial neighborhood cats and that scent could predispose them to want to defend their territory, drawing them into the area where a displaced cat is hiding in silence. These territorial cats are put into defense mode when they detect the pheromones from another cat’s urine and feces, causing them to be ready to fight. These cats are then more likely to beat up and chase the lost (displaced) cat from his hiding place, making a recovery more difficult. However, using cat food (and a wildlife camera) will draw a territorial cat in also, but the scent of food will not likely trigger the same level of aggression / readiness to fight as urine and feces would. None of this has been proven in a scientific study (yet), but it is the opinion of the MAR Network that you are better off investing time and effort in conducting a physical search for your lost cat and using wildlife cameras or a humane trap than you are in putting out dirty cat litter. You can likely find many on-line testimonials from cat owners who claim positive results from scent luring scattering dirty cat litter or feces in their yards or placing their cat’s litterbox on their porch. It is more likely that these cats returned home due to one of two factors: a behavior called “The Threshold Phenomenon” (described above) or simply due to their temperament than due to anything that they smelled. Cat owners mistakenly associate the fact that their cat returned home due to a scent lure (dirty cat litter) when, in fact, their particular cat would have returned home on its own anyway with or without a scent lure because it finally reached its threshold (indoor-only cats hiding in fear) or the cat was trapped somewhere and finally got free (outdoor cat trapped in neighbor’s garage, up a tree, etc.). As stated earlier, in many cases a food lure (placed inside a humane trap or set down on the ground with a wildlife camera pointing at it to capture photos) is the best type of lure to use and is a highly effective recovery method. Another scent that could help (at a humane trap) is to spray Feliway, a pheromone that helps to calm stressed cats. The final reason why the MAR Network does not advocate using dirty cat litter as a scent lure for cats is the most important one: it is a passive approach to finding a lost cat. Cat owners might believe they are “doing something” by placing dirty clothing or cat feces in their yard. Some Internet folklore posts have claimed that “cats can smell a mile away” and advise you to simply put your cat’s litterbox outside, claiming “it works!” However, scientific research has shown that these cat owners would have a higher chance of recovering their cat by conducting an aggressive, physical search of their yard and their neighbor’s yards. We understand that it is less intrusive to your neighbors to set out a dirty cat litter box on your porch and hope that your cat will come home than it is to ask your neighbor permission to enter their yard and to crawl around under their house or deck, but a physical search of your neighbor’s yards (and baited humane traps and/or digital wildlife cameras) is the most effective recovery method for finding a missing cat. Visit our Lost Cat Behavior page for more tips.